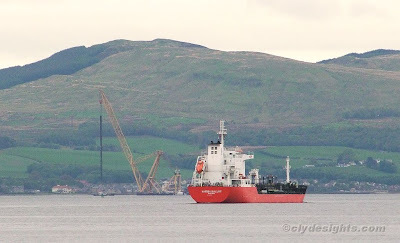 Another view of MARIDA MALLOW as she makes her way towards Kempock Point on Saturday morning with, in the far distance (actually about 6 miles away), the Dutch sheerlegs TAKLIFT 7 making her slow way from the Great Harbour to Faslane. The floating crane is being towed by the small tug EERLAND 26, and suspended from the boom is the one of the four guidepiles which will locate the Valiant Jetty, and allow it to rise and fall with the tide. For this task TAKLIFT 7 is fitted with a longboom of 130 metres, while the pile itself is about 75 metres long.